Tell your friends that you are going to Jordan, and they’ll respond, ‘Petra!’ either with gleeful satisfaction or longing. So would it match up to expectation? Our guide was fully aware of this. He explained that we would start at 8.30, not at 8 as on our programme. Why? Well, all the other tours go at 8 am. We would miss the crowd by going a bit later. It was a bad season because of the troubles in neighbouring Syria, but there were still plenty of visitors. It was a good reason, and doubly welcome so we could catch up with a bit of sleep! The others in our group were in a hotel right by the visitors’ entrance, so we had to leave first, on foot. I put on my laced-up leather shoes, with rubber-type soles. There would be a long walk to the gorge, through it, and much else. They’d be fine. And, to be honest, my trainers wouldn’t fit into the stirrups. I had decided to ride one of these Arab horses with head and tail held high – a noble animal, hard to resist and very different from the camel I had tried out in Wadi Rum. It was only possible to do it from beyond the ticket office to the gorge, but at least it would give me an idea of how the original explorers, the Swiss Burckhardt who had discovered Petra and others in the early 19th century, would have travelled. I had to dismount before entering the narrow gorge as there were too many people and too little space. A horse would have bolted. 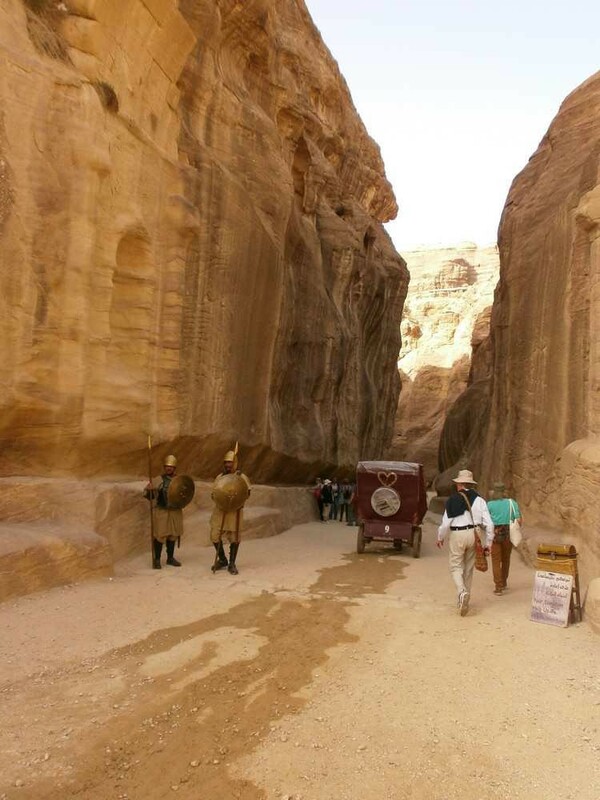 We walked over patches of Roman road laid after 106 AD when Petra was conquered, stopped by shrines of various Nabataean gods and goddesses to help us on our way, and a worn frieze of men walking along the narrow gorge with a camel caravan, shown as it would have been on a display board. 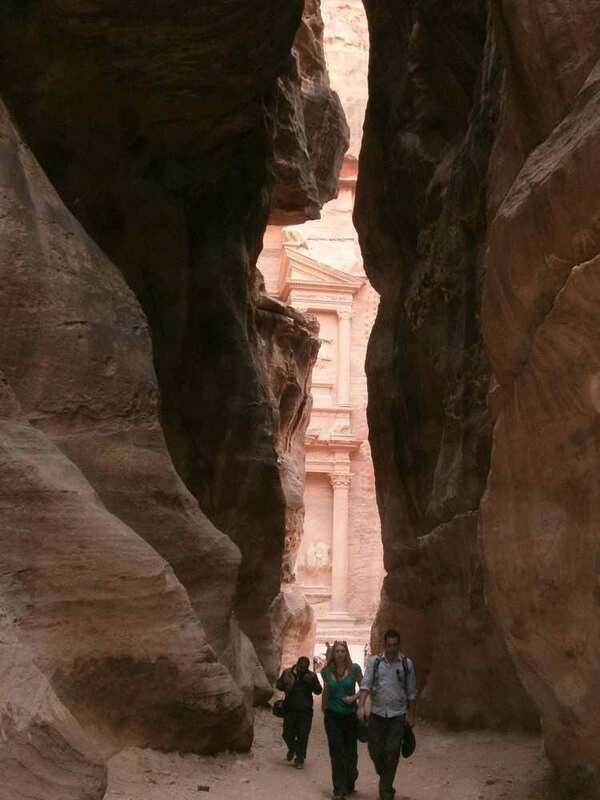 Strange, as our guide was telling us that the Nabataeans and the caravan leaders would have walked, like us, while the caravans were catered for at Little Petra. We’d go there tomorrow. So what were they up to here in Petra proper? He then stopped to show us a crack in the rock face where streams flowed into the water channels along each side of the gorge, originally above one’s head but now at hip height. It was morning. We were walking due west, and when we turned back to continue we were stopped by blinding sunlight at the end of this narrow gorge and glimpsed some columns, part of a pediment – a monumental building. We were as excited and impressed as the Nabataeans expected us to be. We emerged into a small open area in front of what looked like a huge temple but was instead a tomb gouged out of the pink sandstone, that was the first of many following the same rough format: the large-scale classical language of late Greek and early Roman architecture mingling in what is loosely called the Hellenistic style, or the Baroque of the Ancient World. Here is was, the so-called ‘Treasury’, misidentified because of the urn on the peak of the pediment. Once thought to have e contained gold coins, bullet holes were visible. Nothing was found. Much more was to follow.